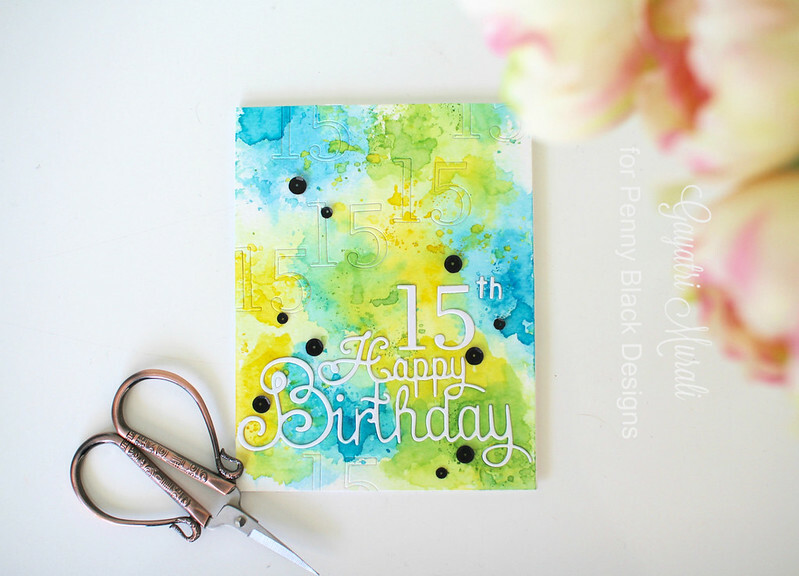 I have a birthday card to share using Penny Black dies and no stamping involved. I have used two Penny Black dies called Your Day and Numbers. Started with smooshing distress inks Squeezed Lemonade, Salty Ocean, Twisted Citron for the first layer of colour wash. Then I added couple of layers of Mermaid Lagoon, Mowed Lawn and Mustard Seeds to add texture, layers and saturation to the colours. I left the panel to dry. By the way, I have used watercolor paper as my panel. Once the panel is dry, I embossed the Your Day die to wards the bottom of the panel. Then I embossed the “15th” above the happy birthday to the right. 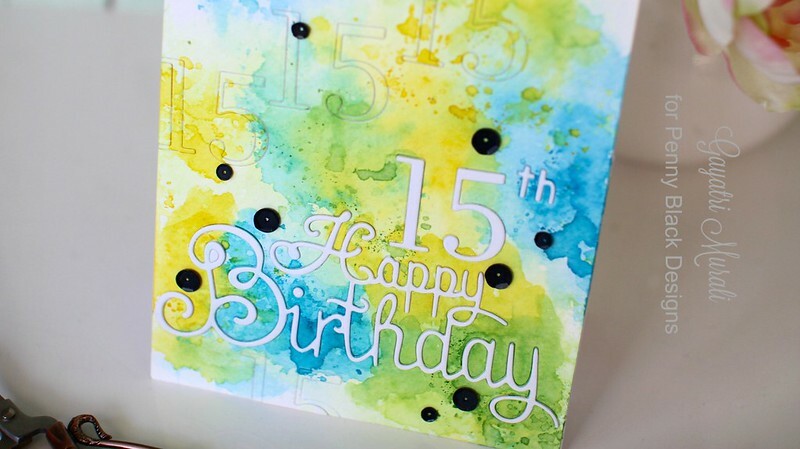 I love the embossing so I randomly embossed the “15” all over the paper. I adhered the panel on the card base. Although I loved the embossed look of the dies, I felt that the sentiment got lost in all the layered colours of the background. To make the sentiment stand out, I die cut the Your Day die and “15th” out of white cardstock and adhered over the main embossed image. Now the main sentiment pops out of the background. I left the rest of the embossed images as it for added interest. To add contrast, I embellished with Onyx sequins from Pretty Pink Posh. Hope you like my card. I gave this card to my daughter yesterday for her birthday! She loved it. All the Penny Black die I used to make this card are available for purchase from Penny Black store. A beautiful card Gayatri. Happy Birthday to your daughter. love the way the white sentiment pops off your beautiful background! 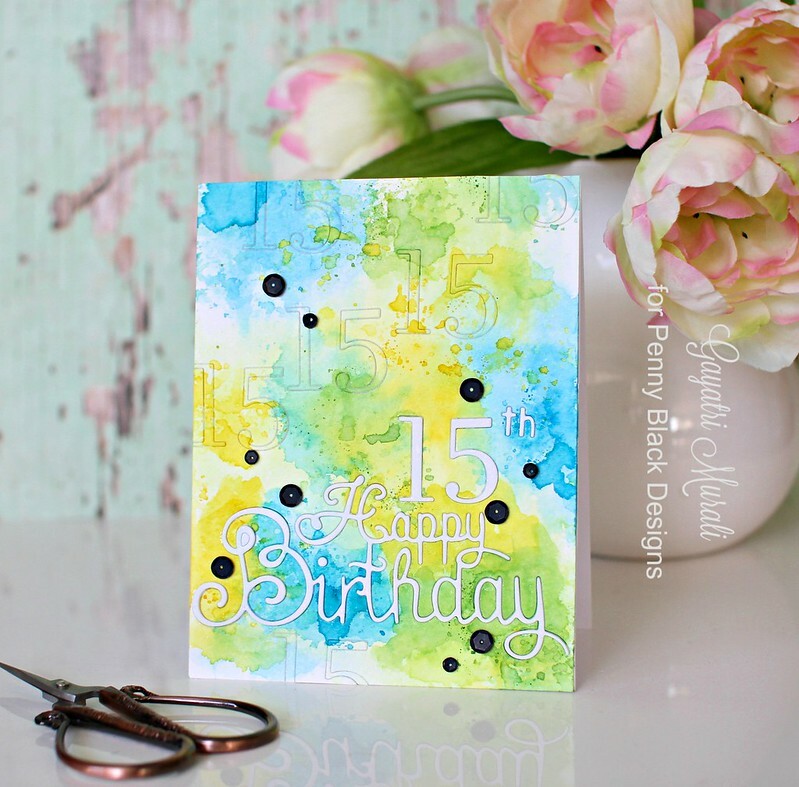 Such a great card, and especially for a teen! Really fun!